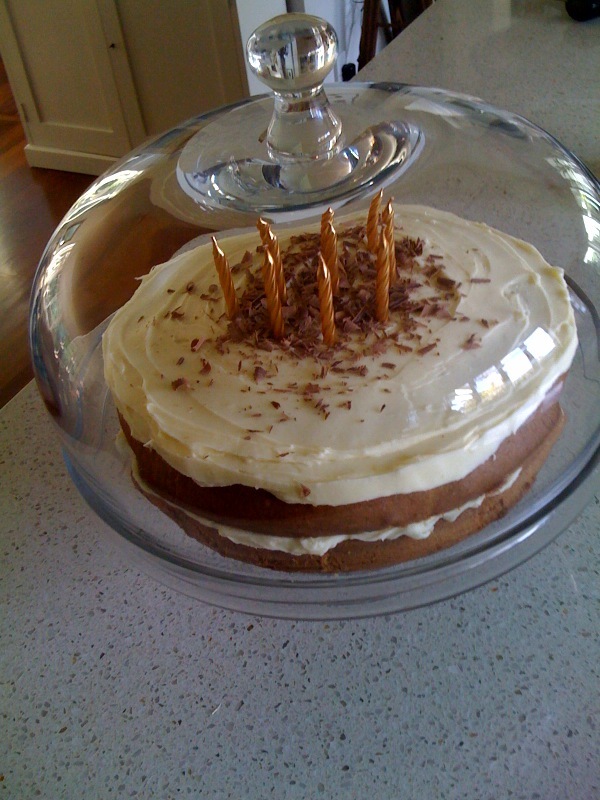 I’m back!… With a White Chocolate Coffee Layer Cake! It’s been a while, too long in fact, but I’m pleased to say I’m back and the posts will be coming thick and fast as so much has happened in the last 3 months! First things first, I must apologise for my quietness on the blog. The adjustment to parenthood, sleep deprivation and two house moves have kept me very occupied, but things are settling down now. Our little boy is now almost 4 months old, he’s bringing us so much joy with lots of smiles and responses, and he’s also been sleeping through the night for a while now (bliss!). With his routine a bit more predictable and my extra hours of sleep, I’m finding I have more energy and time to be creative again. It’s nice to be living in our own home and I’ve enjoyed finding new places for our furniture and dressing the rooms. I’ll put some pictures up of Will’s nursery soon (yes, this is his THIRD nursery!). We’ve started a bit of work around the house, I’ve just finished two sets of curtains for the bedrooms, hubby has removed a lot of plants from the garden and marked it out ready to dig up and replant, and we have some renovations about to start. There’s so much to look forward to, I’ll be sure to keep you updated on these things. In the meantime, here is a delicious recipe for you to try! It was my older brother’s birthday back in July and I decided to bake something a bit different. I’m really into recipes that use white chocolate at the moment and I found this one in Cadbury’s latest recipe book, so here it is ‘White Chocolate Coffee Layer Cake’. (Watch it closely, I overcooked mine a bit so it was a bit dry. I’d also recommend doubling the amount of coffee as we all agreed the coffee flavour was very subtle – it was still delicious though!). COMBINE the flour, butter, sugar, coffee and eggs in a bowl and beat with an electric mixer until smooth, add the milk and stir until combined. Divide between 3 greased and paper lined 28cm cake pans. BAKE in a moderate oven 180°C for 20 minutes or until cooked when tested. Stand for 10 minutes before turning out onto a wire rack. Cool. COMBINE the chocolate and extra butter in a bowl over simmering water. Stir over a low heat until the chocolate has melted. Cool slightly. Beat together the cream cheese and icing sugar with an electric mixer until smooth then beat in the chocolate mixture. Divide the frosting into 4 portions and chill. SANDWICH the three cake layers together using half of the frosting. Spread another portion thinly over the top and sides of the cake. Chill for 1 hour. Use the remaining portion to finish the top and sides of the cake with a decorative pattern. Chill to allow the frosting to firm before slicing.